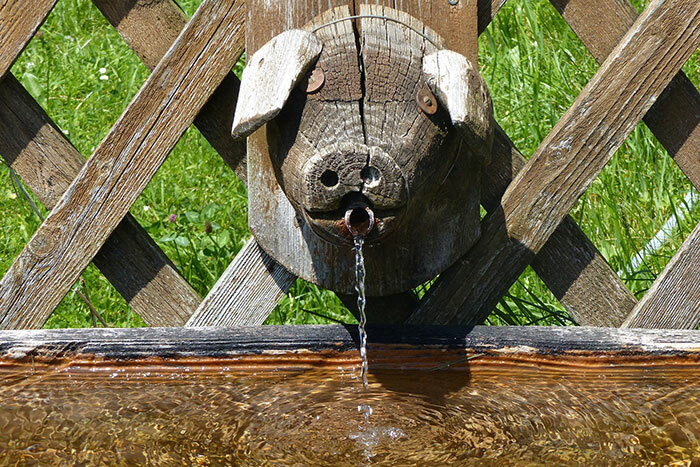 The outdoor water fountain is an important detail and requires careful thought for the garden setting. This popular water feature makes no difference what its construction is, as long as it fits in with the scheme. The location of a garden water fountain demands serious attention. 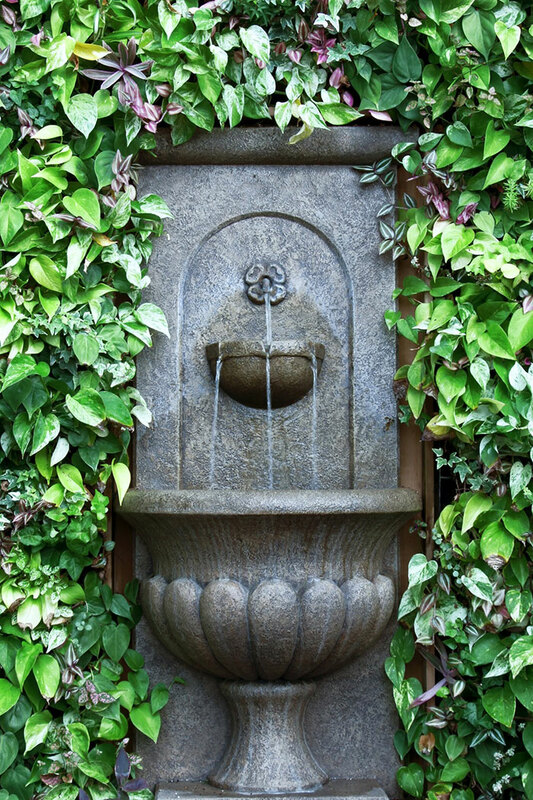 More especially is this true when wall fountains have been designed as a part of the retaining wall and are surrounded by some choice vine whose flowers accentuate the architecture. The fountain is often placed where it will attract attention to some special landscaping feature that has been carefully planned. 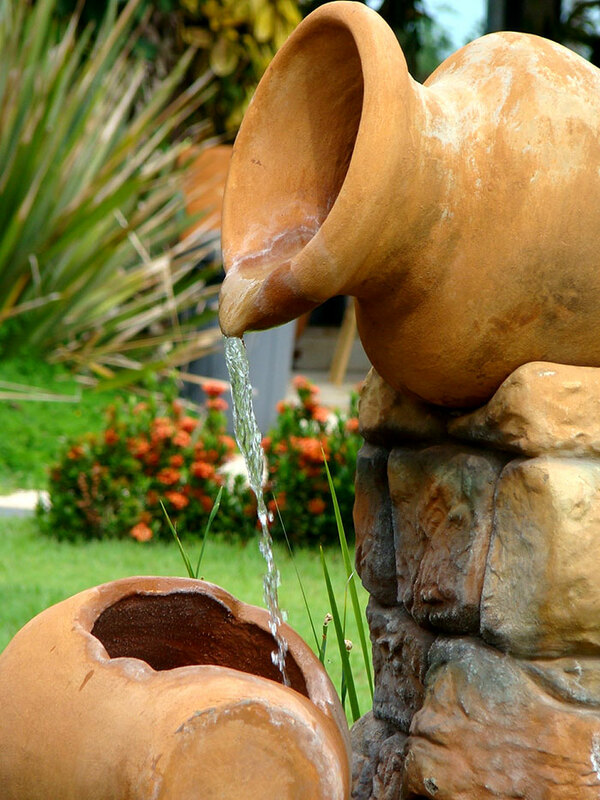 There are so many styles and features connected with this garden water feature that it is easy not to duplicate a neighbor’s. 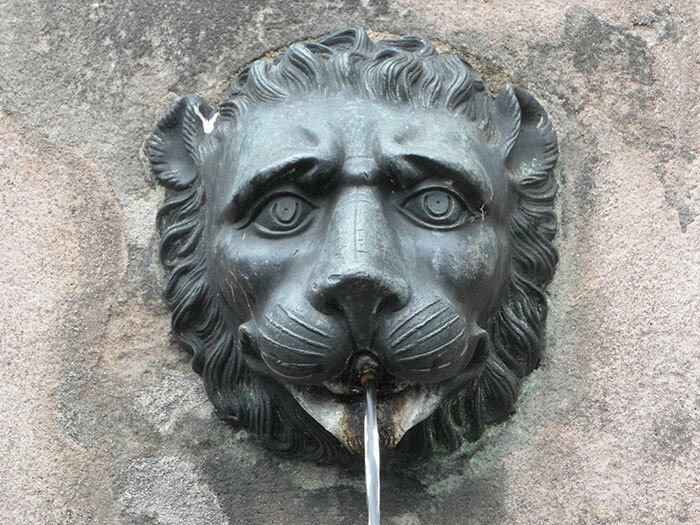 A water fountain wall is an ideal location with which to recreate the fauns, satyrs and nymphs of the garden. 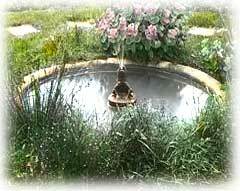 Animals, too, are often used in water gardens and so are cupids. 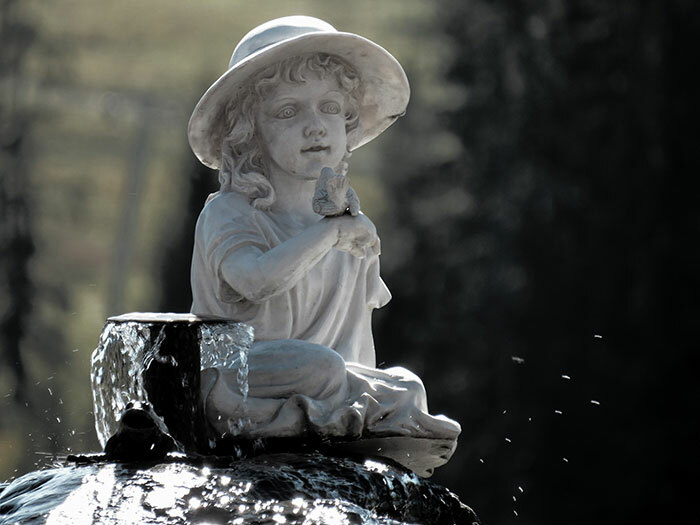 The planting surrounding a garden outdoor fountain is of as much importance as the fountain features and depends upon the size of the pool and its location. Shade in this water feature requires far different treatment than sunny exposures, while the heart of a grass plot lends itself to little or no floral embellishment on the garden fountain. 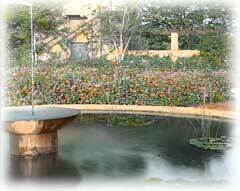 The finish of the fountain pool influences the arrangement of the flowers. Should it be very ornamental, the planting should be far enough away not to shut off the fountain’s picture effect in the landscape. If it is simply a curbing, it should have a setting of green or of low-growing plants. Often an effective treatment surrounding a water fountain is worked out through a border of velvety turf outlined by plants. Peonies never fail to bring out the right coloring of outdoor fountains if planted far enough away not to cut off the design. Peonies are rightly called the aristocrats of the flower garden. For mass planting in a water fountains garden, they are most effective, their great gorgeous blossoms, daintily dyed and ranging from white to the deepest red, their wonderful fragrance and their decorative value are unsurpassed. They can either be planted in solid color near the fountain or in a combination that is artistic. The Couronne d'Or, beautiful white in coloring and showing blossoms of red in the center with a halo of yellow around, makes a picturesque contrast to the deep green of the tree leaves. The large, double, ball-shape bloom of the Felix Crousse intermixed with white, gives one of the most fascinating combinations of red and white. The beauty of peonies is that they grow anywhere although they do best in rich, deep soil and with a sunny exposure. They are perfectly hardy, require no protection and unlike most other plants are not infested by either insects or disease. All they ask for is plenty of water during their growing season. 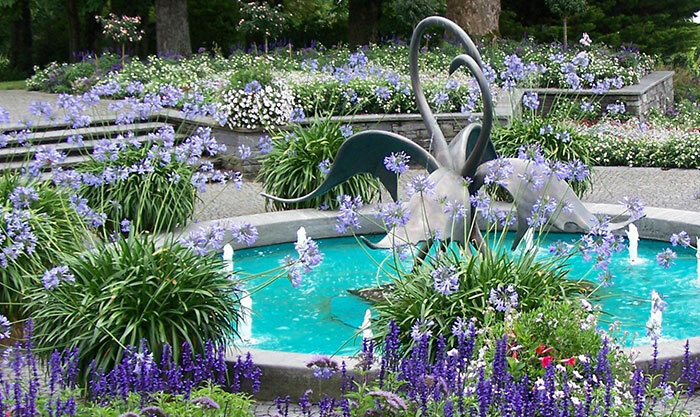 Iris is particularly desirable as a planting around a water fountain. As you can buy both double and single Irises, you should make a choice and not mingle the two. The double with its flowers averaging from eight to ten inches across, is an artistic foil for the white of the outdoor fountain. Commencing with the German, which comes into bloom about the middle of May, we can follow the time of blossoming through the introduction of the Japanese iris which lasts through July. 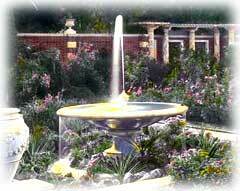 In their planting, better effects are produced in the water fountains garden if two colors only are used. Camillians, which are a delicate blue with falls tipped a little darker shade, are more suited for a pond fountain with a low curbing or for an informal garden where cement is used. They give a very pretty effect, their flowers being pictured in the water below. 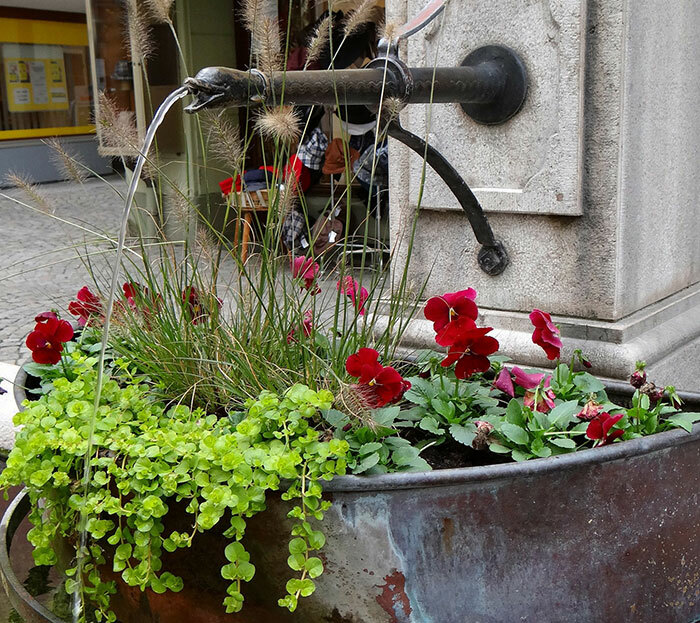 Pansies are never out of place when landscaping with garden fountains and water features. A very pretty idea is to have them massed for as many as eight inches around the curb of the water fountain. Choose for these, bright colored varieties rather than dark. The tufted pansies, which are one of the most important bedding plants, are a favorite. One reason for this is that they flower continuously for nearly eight months in the year. The flowers are not as large as those of the single pansy, but their bright colors make them a welcome addition to a garden water feature. The rich, golden yellow, the violet with a dark eye and the white are all three admirable choices for outdoor fountain ornamentation. Pansies love coolness and give their largest and finest flowers in early spring and late fall. They are so easy to grow and will endure all winter long if protected by a few evergreen vines. 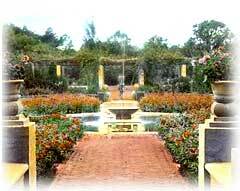 The size needed for bedding for your garden water feature depends entirely upon the width of the bed. Ornamental grasses can also be used with telling effects for the border of the fountain, although care must be taken not to plant those that grow to enormous height. The Eualia Japonica is appropriate. Its long, narrow, graceful green foliage, flowering into attractive plumes, give it a distinctive place for this purpose.